Infrared (IR) is a form of electromagnetic radiation that has a wavelength slightly longer than the color red in the visible light spectrum. Infrared radiation is created when objects are heated at temperatures not quite high enough to make them glow. You can detect infrared radiation by the heating effect it has on your skin. Special sensors are also used to detect IR. This type of radiation is used in electric heaters, greenhouses and night vision sensors. What are some properties of infrared radiation? How is infrared created and detected? What are some applications of IR? Within the electromagnetic spectrum, the wavelength of infrared is shorter than microwaves and longer than the color red in visible light. The wavelength of infrared radiation ranges from 0.75 µm to 1000 µm. Some books also use nm or nanometer to denote wavelength. A nanometer is 0.001 of a micron or 10-9 meter. Thus 0.75 µm is the same as 750 nm. Although nitrogen (N2) and oxygen (O2) gases make up a large portion of the atmosphere, they do not absorb infrared. However, water vapor (H2O), carbon dioxide (CO2), methane (CH4) and ozone (O3) molecules in the atmosphere absorb much of the infrared radiation coming from the Sun. There is a band of wavelengths between 8 and 12 microns where little infrared radiation is absorbed in the atmosphere. Radiation in this band of wavelengths is what reaches the ground to heat things up. Infrared radiation is sometimes called thermal radiation, because warm or hot objects emit infrared. For example, the heat you feel at a distance from an element on an electric stove is infrared or thermal radiation. Infrared radiation is usually created or given off by warm and hot objects. It is detected by its property of increasing the thermal energy of objects. 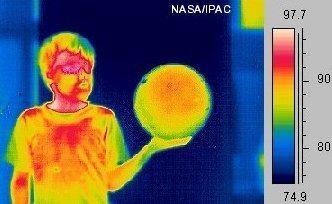 When objects increase in temperature, they give off infrared radiation before they give off visible light. But that also means that object that give off visible light also usually are giving off IR too. As the metal element of an electric heater or stove heats up, it starts to give off infrared radiation well before it gets red hot. 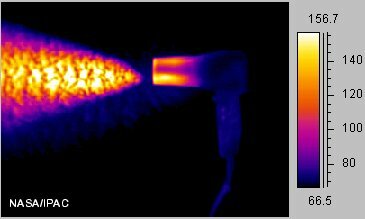 The picture below shows a the various amounts of infrared radiation given off from an electric hair dryer. The temperature gauge on the side indicates the temperatures in °F, by the different colors. These are not the real colors detected, but rather false colors used to illustrate the different temperatures. The ground, lakes and the ocean are heated by visible and infrared light. They then radiate a longer wave infrared back into the environment. Since the human body is warm, it radiates infrared. This can be demonstrated by someone wearing night vision goggles. A simple way to detect infrared is by feeling the effect the radiation has on your skin. IR will heat your skin at a distance from the source. Note that infrared is not heat. The radiation causes objects to heat up. Various IR sensors detect the radiation, depending on the wavelength. Many infrared sensors are made of silicon, but there are also many made of exotic materials. A common use of infrared radiation is in electric heaters. The coils get warm or even hot and radiate IR that will heat items it hits. Often a curved shiny plate is behind the heater element to focus the radiation outward. Greenhouses trap infrared radiation to remain warm in winter months. Night sights use the heat given off by objects and people to navigate in the darkness. These sensors are also used to detect heat loss in buildings and by forest rangers to spot the location of beginning forest fires. Infrared is used to show the changes and differences in temperature. It is used in medicine to show hot areas on a person's skin, indicating an infection or disease. It is used to show where cold or hot areas are in a house, indicating the need for thermal insulation. The pictures below show the temperature difference between a ball that is cold and one that has been heated. But also note the various warm areas on the boy's face. Again, the gauge on the right shows the temperature for the various false colors. Astronomers use infrared telescopes to penetrate dusty regions of space that block off visible light. Also, the Doppler effect on objects in space that are moving away from the Earth will cause a red-shift in the light, moving some into the infrared region. This allows astronomers to determine the speed of the object with respect to Earth. Finally—and very important to some people—is that infrared is used in your remote television channel selector. An infrared signal is sent from the channel selector to an IR detector on the television set, allowing you to change channels without every getting off your chair. Infrared is a form of electromagnetic radiation with wavelengths between microwaves and visible light. 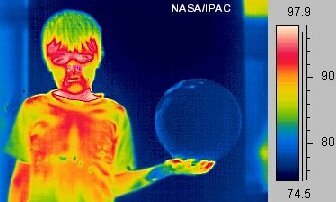 Infrared radiation is created when objects are heated. You can detect infrared radiation by the heating effect it has on object or with special sensors. This type of radiation is used in electric heaters, greenhouses and night vision sensors.